In the late 1960s, the essential role played by T cells in antibody production was reported. This led to our hypothesis that certain molecules would have to be released from T cells to effect the stimulation of B cells. This hypothesis was shown to be true. There were certain factors present in the culture supernatant of T cells that induced proliferation and differentiation of B cells. The factor that induced B cells to produce immunoglobulins was initially named B cell stimulatory factor-2. The cDNA encoding the human B cell stimulatory factor-2 was cloned in 1986. At the same time, IFN-β2 and a 26 kDa protein in the fibroblasts were independently cloned and found to be identical to B cell stimulatory factor-2. Later, a hybridoma/plasmacytoma growth factor and a hepatocyte stimulating factor were also proven to be the same molecule as B cell stimulatory factor-2. Various names were used for this single molecule because of its multiple biological activities, but these have all been unified and the molecule is now known as IL-6. Since the discovery of IL-6, rapid progress has been made in our understanding of IL-6 activities, the IL-6 receptor system and the IL-6 signal transduction mechanism. More importantly, it has been shown to be involved in a number of diseases such as rheumatoid arthritis and Castleman's disease. When taking into account all the accumulated basic research on the various aspects of this molecule, it appeared that blocking the activity of IL-6 was a feasible, new therapeutic approach for chronic inflammatory diseases. Interactions between T and B cells during antibody production were reported in 1968 [1, 2], and it was theorized that certain molecules are released from T cells and stimulate B cells to produce antibodies. Activities that induce proliferation and differentiation of B cells were observed in supernatants of cultured T cells. The molecules responsible for these activities were subsequently discovered by our group and termed B cell growth factors and/or B cell differentiation factors. Table 1 summarizes the research that subsequently led to the characterization of factors involved in the interactions between T and B cells. BCDF, B cell differentiation factor; BCGF, B cell growth factor; BSF, B cell stimulatory factor; IL, interleukin. In 1986 one of these factors was cloned and studied, and it is now referred to as IL-6. This molecule possesses a wide range of activities, and as a result laboratories used various different names to refer to it, depending on their research interests. It has been termed B cell stimulatory factor-2 and was considered a novel IFN (IFN-β2), but studies with recombinant IL-6 and anti-IL-6 antibody demonstrated that IL-6 had no IFN activity . The molecule exhibited a strong stimulatory effect on growth of murine plasmacytoma  and human myeloma , and was studied under the names hybridoma plasmacytoma growth factor and hepatocyte stimulating factor, which induces acute phase reactions [6, 7]. Moreover, because it induces differentiation of myeloid precursors, it has been referred to as macrophage granulocyte inducer type 2 . In addition, IL-6 plays a key role in inflammation, being the main inducer of C-reactive protein, fibrinogen and serum amyloid A protein, as well as other factors. The activities described above were confirmed using IL-6 transgenic mouse models, revealing massive stimulation of plasma cells in the spleen and lymph nodes. Transgenic expression of IL-6 in BALB/c mice induced monoclonal transplantable plasmacytoma, showing that IL-6 functions as a plasmacytoma/myeloma growth factor. A study conducted in an IL-6 knockout mouse model  revealed that, compared with wild type, the antiviral antibody response was inhibited by more than 90% following immunization with a vesicular stomatitis virus. In a parallel experiment turpentine injection induced strong inflammation, but, once again, in the IL-6 knockout mice almost 90% of this acute phase response was blocked. These experiments confirm that IL-6 functions as a B cell stimulatory factor to induce antibody production and as a hepatocyte stimulatory factor to induce acute phase reactions. As well as the functions described above, IL-6 has various other biological activities (exemplified by the numerous abbreviations used to describe IL-6). IL-6 is a pleiotropic cytokine that influences antigen-specific immune responses and inflammatory reactions. It has also been shown to induce T cell growth and cytotoxic T cell differentiation by augmenting IL-2 receptor expression  and IL-2 production . IL-6 also induces proliferation of thymocytes and probably plays a role in the development of thymic T cells. In haematopoiesis, IL-6 acts synergistically with IL-3 to support the formation of multilineage blast cell colonies, and it also induces macrophage differentiation and megakaryocyte differentiation . IL-6 has profound effects on bone and can induce osteoclast differentiation and activation in vitro . It appears to be involved in synovial inflammation and in damage to peri-articular cartilage and bone. A correlation has also been identified between serum IL-6 levels and the severity of radiographic destruction . Furthermore, it has been demonstrated to decrease aggrecan protein and type II collagen production by chondrocytes . IL-6 induces endothelial expression of adhesion molecules and endothelial production of monocyte chemoattractant protein-1 , a chemokine that is responsible for monocyte recruitment. Moreover, IL-6 knockout mice exhibit impaired leucocyte accumulation at the site of inflammation  and defective transition to a chronic mononuclear cell infiltrate . It is also involved in the recruitment of mesenchymal vascular cells and neoangiogenesis in vivo , and has been shown to induce proliferation of synovial fibroblasts . Finally, IL-6 appears to be involved in damage to cartilage and bone . Following the cloning of the cDNA of IL-6, the structure and signaling function of the IL-6 receptor was studied. The IL-6 receptor system has an unusual organization. It consists of two polypeptide chains : an 80 kDa IL-6 receptor and a 130 kDa signal transducer (gp130). The 80 kDa receptor exists in two forms, namely the transmembrane form and a soluble form. The transmembrane form has a short intracytoplasmic region and, upon stimulation by binding of the IL-6 molecule, triggers an association with gp130. The soluble receptor can form a stimulatory complex with IL-6, which can associate with gp130 and trigger cellular events called trans-signaling. The gp130 has a transmembrane domain and is responsible for transducing the signal across the membrane. It is worth noting that the gp130 is expressed ubiquitously in tissues  and is used in the signaling of many other members of the IL-6 family of cytokines, including leukaemia inhibitory factor, ciliary neurotrophic factor, oncostatin M, IL-11 and cardiotropin-1 [22–26]. The sharing of the gp130 molecule by other IL-6 superfamily cytokines may explain their functional redundancy. This can also be seen within the other cytokine systems, for example IL-3, IL-5 and granulocyte-macrophage colony-stimulating factor, and the group of interleukins (IL-2, IL-4, IL-7, IL-9 and IL-15); both groups use a common receptor component. IL-6 and its receptor interact to form a complex consisting of two IL-6 molecules plus two IL-6 receptor proteins and two gp130 proteins. The dimerized gp130 then transduces the signals. It is worth noting that the soluble IL-6 receptor also exhibits an agonistic effect in complex with IL-6 and can couple with the gp130 to effect transduction. One of the difficulties in understanding the mechanism of action of gp130 arises from the fact that it does not possess a specific catalytic domain. This issue was resolved with the discovery of the Janus activated kinase (JAK)-signal transducer and activator of transcription (STAT) pathway; these catalytic molecules associate with the cytokine receptors . The signaling has now been completely elucidated. Activation of gp130 leads to the activation of the intracytoplasmic JAK tyrosine kinases (Janus family tyrosine kinases). Within minutes of IL-6 stimulation, these kinases cause induction of tyrosine phosphorylation and recruitment of STAT3, which dimerizes and is translocated to the nucleus and leads to gene expression. IL-6 is essential for regulation of the immune process; however, overproduction of the cytokine leads to inflammation and disease (such as rheumatoid arthritis, systemic juvenile arthritis and Crohn's disease). As a result, the cytokine must be regulated to control both the magnitude and duration of response. IL-6 signaling systems are regulated by negative feedback by the suppressors of cytokine signaling (SOCS) and the protein inhibitors of activated STATs (PIAS). IL-6/IL-6 receptor interaction leads to activation of STAT3, which then targets SOCS-1. The SOCS-1 molecule then binds to the JAK tyrosine kinase and acts as a negative regulator of gp130 signal transduction. SOCS-1, SOCS-2 and SOCS-3 are induced by several cytokines including IL-6, IFN-γ, IL-4, and granulocyte colony-stimulating factor and several other factors, and they inhibit cytokine-activated JAK/STAT signal pathways (Fig. 1). Feedback regulation in IL-6 signaling by SOCS. IL, interleukin; IL-6R, interleukin-6 receptor; JAK, Janus activated kinase; SOCS, suppressors of cytokine signaling; STAT, signal transducer and activator of transcription. 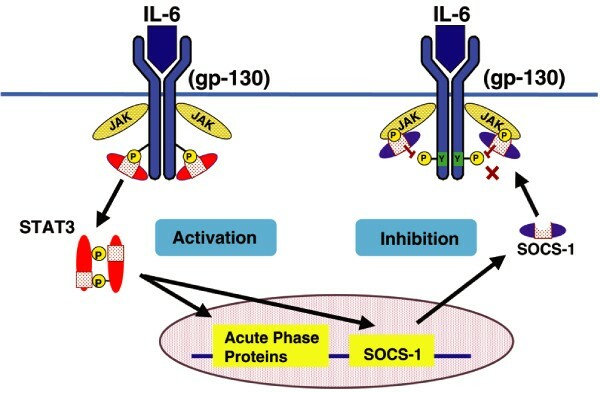 SOCS-1 directly interacts with JAKs and so inhibits their catalytic activity, whereas SOCS-3 inhibits cytokine signaling by binding to the receptor complex. In the IL-6 signal pathway, SOCS-1 deficient mice have an intact IL-6 signaling pathway, suggesting that SOCS-3 may act as a crucial inhibitor of IL-6 signaling in vivo. PIASs constitute a family of constitutively expressed negative regulators of STATs. PIAS-3 associates specifically with activated STAT3 but not with STAT1, resulting in blockade of all STAT3-mediated gene transcription . PIAS-3 is especially well known as an inhibitor of IL-6 signaling in M1 cell lines (a mouse myeloid leukaemia cell line). Constitutive expression of PIAS proteins implies that their physiological role may differ from that of SOCS proteins, which are transiently induced by cytokine stimulation. However, the differences in physiological role between these two proteins are yet to be established. A variety of studies have demonstrated that overproduction of IL-6 contributes to the pathogenesis of various autoimmune and inflammatory diseases. (For a review of IL-6 in auto-immune disease and chronic inflammatory proliferative disease, see the article by Ishihara and Hirano .) That IL-6 is involved in autoimmunity was first implied by the facts that patients with cardiac myxoma frequently exhibit autoimmune symptoms and that cardiac myxoma cells produce IL-6 . Also, synovial fluid from patients with rheumatoid arthritis contain elevated levels of IL-6 . Since those early findings, several lines of evidence have been reported that suggest the involvement of IL-6 in auto-immune disease, chronic inflammatory proliferative disease and B cell malignancy, as well as Castleman's disease, and plasmacytoma/multiple myeloma . Furthermore, IL-6 is required for experimentally induced autoimmune diseases, including type II collagen-induced arthritis and antigen-induced arthritis [33–35], myelin oligodendrocyte protein-induced experimental autoimmune encephalomyelitis [36, 37], and pristane-induced autoantibody production . These findings, together with accumulating evidence from a large body of clinical studies, suggest that IL-6 dependent signaling pathways are involved in the pathogenesis of experimentally induced autoimmune diseases and of naturally occurring autoimmune diseases. However, how and at what levels IL-6 plays its roles in the complex processes of these diseases remain unknown. Based on the findings described above, the potentially therapeutic strategy of blocking the IL-6 signaling pathway seemed logical and appealing. One approach that has been tested was inhibition of the IL-6 molecule itself. However, use of mAbs to human IL-6 in the clinical setting has yielded unsatisfactory results. Administration of a mAb against IL-6 leads to persistence and accumulation of the cytokine in the circulation in the form of immune complexes, increasing the half-life of IL-6. This prevents such a single mAb to IL-6 from neutralizing the effects of chronic overproduction of IL-6 . In mice, the use of a mixture of mAbs directed against different epitopes of IL-6 reduced the cytokine carrier effect of a single mAb . It has also been shown that immunization with a modified IL-6 molecule leads to induction of a polyclonal antibody response to IL-6, which is able to neutralize fully the phenotype induced by chronic overproduction of human IL-6 in human IL-6 transgenic mice . These observations suggest that use of antibodies with multiple specificities for IL-6 may be more efficacious than use of a single mAb. However, neither of these approaches is readily applicable to treatment in humans. At this point the development of an alternative strategy became desirable, and a system to block the binding of IL-6 to the receptor was developed (Fig. 2). In a collaboration between Chugai Pharmaceutical Co Ltd (Tokyo, Japan; now a member of the Roche Group) and the Medical Research Council Collaborative Centre (London, UK), a humanized anti-human IL-6 receptor mAb was developed. A mouse mAb against the human IL-6 receptor was generated from a mouse immunized with human IL-6 receptor, as previously reported . In order to reduce the immunogenicity of the mouse antibody and to prevent induction of neutralizing antibodies, this mouse antibody was humanized to create tocilizumab (previously named MRA) . Tocilizumab has been demonstrated to block the action of IL-6 without increasing the IL-6 half life (as was seen with anti-IL-6 strategies); at the same time there is an increase in the half-life of the antibody (humanization of antibodies has been shown to have this effect). Most importantly, the action of the soluble IL-6 receptor is also blocked. The soluble IL-6 receptor has been shown to mediate many of the activities of IL-6, including osteoclast formation, synovial fibroblast proliferation and cartilage degradation [44–47]. 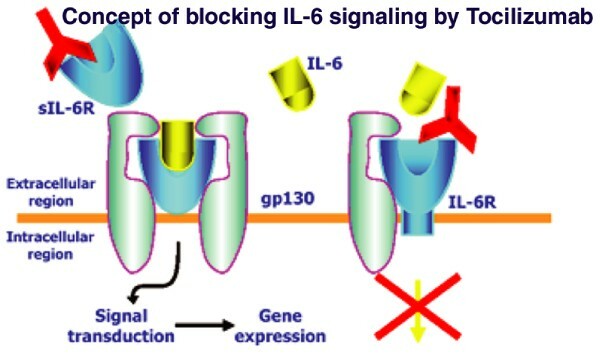 Blockade of IL-6 signals by anti-IL-6 receptor antibody (MRA, Tocilizumab). h, human; IL, interleukin; sIL-6R, soluble interleukin-6 receptor. Clinical studies have shown the utility of IL-6 receptor blockade in Castleman's disease . Studies have also demonstrated acceptable safety and significant efficacy in trials in both adult rheumatoid arthritis and systemic onset juvenile arthritis [49–52]. Because the effects of anti-IL-6 receptor antibody treatment on the diseases were so dramatic, further studies of immune functions and gene expression in patients before and after treatment might provide important insights into the pathogenesis of these diseases. The following papers further investigate the specific effects of IL-6 biology in animal models and in humans and the effects of blocking the IL-6 receptor. The author thanks Osamu Okuda, PhD for valuable assistance with the preparation of this manuscript. TK has received funding and reimbursement of travel costs from Roche/Chugai for their contribution at the symposium "IL-6, a pleiotropic cytokine: from bench to bedside". Roche/Chugai are pharmaceutical companies that develop tocilizumab, an anti-IL-6 receptor antibody. TK holds a patent for the anti-IL-6 receptor antibody, which was licensed to Chugai/Roche for development and commercialization.